Note! To be completed. Updated to MIPL release 2.0.1 (kernel 2.6). Major update. Added "Travelling through several foregin LAN's" and "Returning home". Some cleanup and restructuring. Changed the license from GFDL to OPL due to some GFDL problems. Fixed some errors + update. Thanks to Henrik Petander petander (at) tcs hut fi. This document describes the software and procedures to set up and use mobile IPv6 for Linux. “Each mobile node is always identified by its home address, regardless of its current point of attachment to the Internet. While situated away from its home, a mobile node is also associated with a care-of address, which provides information about the mobile node's current location. IPv6 packets addressed to a mobile node's home address are transparently routed to its care-of address. The protocol enables IPv6 nodes to cache the binding of a mobile node's home address with its care-of address, and to then send any packets destined for the mobile node directly to it at this care-of address.” --- RFC3775, page 1. “Without specific support for mobility in IPv6 [RFC2460], packets destined to a mobile node would not be able to reach it while the mobile node is away from its home link. In order to continue communication in spite of its movement, a mobile node could change its IP address each time it moves to a new link, but the mobile node would then not be able to maintain transport and higher-layer connections when it changes location. Mobility support in IPv6 is particularly important, as mobile computers are likely to account for a majority or at least a substantial fraction of the population of the Internet during the lifetime of IPv6.” --- RFC3775, page 5. For all the details, read RFC3775: "Mobility Support in IPv6"
The Mobile Node (MN) travels to a foreign network and gets a new care-of-address. The MN performs a binding update to its Home Agent (HA) (the new care-of-address gets registered at HA). HA sends a binding acknowledgement to MN. A Correspondent Node (CN) wants to contact the MN. The HA intercepts packets destined to the MN. The HA then tunnels all packets to the MN from the CN using MN's care-of-address. 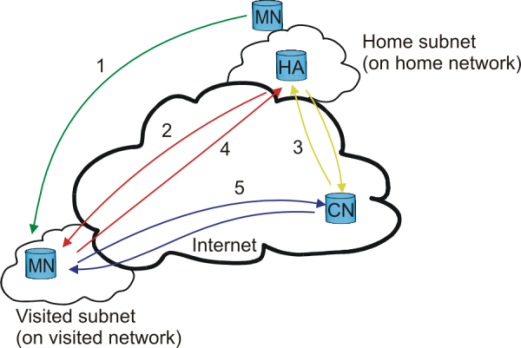 When the MN answers the CN, it may use its current care-of-address (and perform a binding to the CN) and communicate with the CN directly (“route optimization”) or it can tunnel all its packets through the HA. See figure "Mobile IP" for an explanation. You should have basic knowledge of IPv6 stateless auto-configuring to fully understand how “mobile IPv6” (MIPv6) works. You can read up on IPv6 Stateless Address Autoconfiguration in [RFC2462]. For more information on IPv6 in general, visit the IETF's IPv6 Working Group. 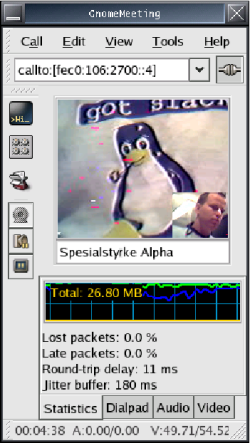 The Helsinki University of Technology MIPL project are behind the only up-to-date Mobile IPv6 implementation for Linux. The latest kernel supported is 2.6.15 and is compatible with RFC3775. Visit http://www.mobile-ipv6.org/ for papers, software or to browse the mail archive. The implementation includes both a kernel modification (a kernel patch) and user space software. Patching and recompiling the kernel can easily render your system unbootable. If you've never done this before, I strongly suggest you take a look at the Linux Kernel HOWTO. The MIPL MIPv6 implementation requires a kernel patch. The implementation modifies the IPv6 kernel stack, so a kernel recompile is necessary. The installation process is well documented, but I will give a brief step-by-step howto. Both the Mobile Node (MN) and Home Agent (HA) needs their kernel patched, but they do not require all the same kernel options. Details below. If you get any “failed chunks” (errors/warnings), do not proceed. Go carefully over the above step once more. To be sure you have all the correct options, you can run chkconf_kernel.sh, which is a small shell script included in the MIPL tarball. If the script reports any missing options, fix it before you proceed. All kernel options are as they should. Next you should compile and install your kernel. Hint: To easily distinguish this kernel from other kernels, you can change the “EXTRAVERSION” variable in the /usr/src/linux/Makefile to for example “-MIPv6-1”. Read the Linux Kernel HOWTO for detailed instruction on how to patch, compile and install your new kernel. Next, configure, compile and install the source code. Note that we include the --enable-vt option to configure. This option is not required, but will provide us with helpful information. It will enable a virtual terminal listning on localhost port 7777. The documentation mention that there is a set of init (startup) scripts available under the extra/ directory. I could only find some example configuration files there. Below is a init script for Debian and Ubuntu. It should be a small effort to make this work on other distributions as well. All init scripts are located under /etc/init.d and symlinked to correct runlevel (/etc/rcX.d). Note that this script override and sets the verbosity level to 0. #              support (RFC3775). Init script for Debian and Ubuntu. echo "IPv6 support must be enabled in the kernel for $DESC to work." # Can we fint the mip6d? echo "Unable to find $DAEMON." echo "ERROR: $CONFIG does not exist or is empty." echo "       See mip6d.conf(5) for configuration file syntax and example"
echo "       configuration. $DESC will *not* be started." Now you should have a working MIPv6 patched kernel, installed userlevel tools and enabled automatic startup at boot. If anything went wrong, go through the above sections carefully. The addresses we are using in our test-bed are site-local. You may as well use global addresses, but do note that link local addresses won't work! Our test-bed consist of four nodes; see figure "Mobile IPv6 testbed". HA - Home Agent: The HA is located at the home network with address fec0:106:2700::2, with one wireless interface. MN - Mobile Node: When MN is on the “home network”, it has address fec0:106:2700::4. When MN travels to another network, it generates a new “care-of” address. R - Router: This is the router from the home network to the internet. It has one wireless interface with address fec0:106:2700::1 and a wired interface with address fec0:106:2300::2. 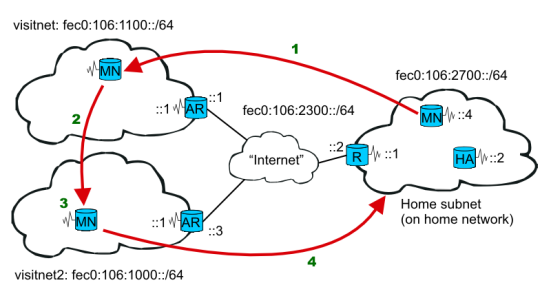 AR - Access Router: The link between AR and R is our “internet” - but in this testcase only a	cross-cable (can be any network). The AR has two interfaces; the wired interface to R has address fec0:106:2300::1, the wireless has address fec0:106:1100::1. Before we can start testing mobile IP, we need a fully functional IPv6 network. All the nodes should be able to ping each other. This is a crucial part. If, for example, AR is not able to ping HA, then there will be no binding update. I will give a brief instruction to get our network up and running using IPv6. For more info on setting up an IPv6 network, you can read Peter Bieringer's excellent Linux IPv6 HOWTO. I've turned off wireless encryption for simplicity - NOTE that you should ALWAYS use encryption when dealing with wireless networks! Also note that the different wireless networks have different ESSIDs! HA: The Home Agent has one wireless interface. It should have forwarding turned on because it uses normal routing to deliver packets captured from a physical interface to the virtual tunnel interface. Note: You must add a default route or else HA will have problem contacting the MN on visited LAN's. One possible solution is to use HA as the default router of the home network. R: The (home) Router has two interfaces; one wireless and one line. The Router must have forwarding turned on. AR: The Access Router (on a foreign network) also has two interfaces; one wireless and one line. Forwarding must be turned on. Instead of modifying proc variables, you can use sysctl. Note: We are setting static routes on our test-bed. You should now be able to ping all the hosts from every host. When you issue make install, neither init script nor configuration file is installed. Example configuration files are found under the extra/ directory under the source code. You may also consult mip6d.conf(5) man page. The file should be pretty self-explanatory. This is where we use Linux IPv6 Router Advertisement Daemon (RADVD). Read [RFC2462] more more details concerning IPv6 Stateless Address Autoconfiguration. The link-local address generated at boot. A new (superfluous) autogenerated address. Since we are setting autoconf in /proc/sys/net/ipv6/conf/eth0/autoconf to 1, MN will generate a new adress combined with HA's prefix and it's own MAC address. I do not think is it possible to avoid having this address generated. The node is acting as a HA. A VT server listning on localhost port 7777. Next we start Mobile IPv6 on MN. As with HA, we want the verbose messages, so we do not use the init script. The node is acting as a MN. The next lines shows Home Address (HoA) and Home Agent address (HA). Further down it creates a IPv6 tunnel. The node detects that it's on the home network and changed the Home Address (HoA) from the tunnel (ip6tnl1) to the actual interface (eth0). Tunnel is up and ready for connections. Do every configuration as shown above; it's especially important to have a different ESSID on the home net and visited network. Generic movement detection uses Neighbor Unreachability Detection to detect when the default router is no longer bi-directionally reachable, in which case the mobile node must discover a new default router (usually on a new link). The superfluous home network address (because of HA radvd messages and MN autoconf set to “true”). To travel to several visited networks, is no different than travel to one network. The only thing you must have in mind is that you will generate a new address for each visited network. MN travelling through severeal different LANs. MN first visits 'visitnet', as we have been through above. MN is then travelling from 'visitnet' to 'visitnet2'. When at 'visitnet2', MN generates a new IPv6 address and do a new binding update to HA. The AR at “visitnet2”, is configured exactly as the other AR (at “visitnet”), except using address fec0:106:1000::/64 instead of fec0:106:1100::/64. The new autoconfigured address at 'visitnet2'. To really get the feel on how mobile IP works, fire up GnomeMeeting (See the figure GnomeMeeting and start a netmeeting. Note! You must use the latest GnomeMeeting to get support for IPv6! Then do a “travel” and you can see an almost smooth handover. Q: Is it normal to use iwconfig eth0 essid visitnet to control handover? A: No, it has nothing to do with Mobile IPv6. It is just as an example on how you can easily test that your setup works. ESSIDs are layer 2, while Mobile IPv6 is layer 3. Q: Can different wireless networks have different ESSIDs/WEP keys? A: Yes, but you must change this upon arrival to the new network. MIPv6 from MIPL can't do this automatically. Q: If MN has travelled through several visited LAN, and then returning home; the interface still has all the autogenerated IPv6 addresses from all the visited networks! Is there any way to “flush/delete” these addresses? Q: Host B has two interfaces with two different subnets assigned. When I ping B from host A, it does not answer! Why not? Host A knows where host B (subnets) are! Q: How do I set a default gateway in IPv6? Q: Why does the host send a multicast address rather than an anycast address, requesting for router solicitation? A: Because the host wants an answer from every router, not from just any router. The idea is to be able to get all parameters and to choose the “best” default router. Q: Why doesn't MN notice that it has moved? A: It thinks that it's previous router is still reachable. This may result from very large lifetimes in router advertisements. Check the configuration of the program sending router advertisements in the router. If the program supports router advertisement intervals, you can use this to help MN in movement detection by setting the use of interval to on. See radvd.conf(5) for details. Copyright (c) 2003-2006 Lars Strand. This document was originally written in LaTeX using Emacs. HTML version created with latex2html. Later it was converted to DocBook XML. Suggestions, corrections, additions wanted. Contributors wanted and acknowledged. Flames not wanted. Thanks to Andreas Hafslund (andreha [at] unik.no) for initial support. Also thanks to UniK (University Graduate Center) http://www.unik.no and FFI (Norwegian Defence Research Establishment) http://www.ffi.mil.no for hardware support.